Samsung Rugby Smart review: Tough INC. 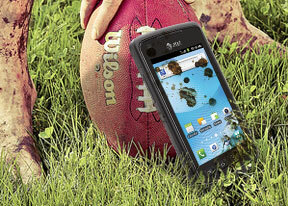 The Samsung Rugby Smart uses the standard Android gallery. The gallery automatically compiles the images and videos no matter in which folder they are stored. It even imports the online photos from your Google Picasa web albums. Little about the Gallery should surprise you. It displays full resolution images and supports double tap and pinch zoom. It supports sharing images over Bluetooth, email, messaging along with uploading to Picasa or using DLNA to push the image to a compatible TV. You also get an image editor preinstalled. It handles the basics like image rotation, cropping (no resize though) and adjusting brightness/saturation/contrast. You can also make selections (using a smart tool similar to the Quick selection tool in Photoshop). It's not nearly as accurate as the Photoshop tool though. You can apply effects too but the one feature that caught our eye was Context fill - similar to Photoshop's Context-aware fill tool although, not nearly as accurate. The My Files app is a simple to use but efficient file manager. It can move, copy, lock and rename files in bulk, even send multiple files via Bluetooth. My files will only browse the memory card and the large internal storage (it can't access the system drive). The Samsung Rugby Smart uses the standard TouchWiz music player. Samsung have enabled equalizer presets (including a custom one) along with the sound-enhancing DNSe technology and 5.1 channel virtualization. By default, tracks are sorted into four categories - All, Playlists, Albums and Artists. From the settings, you can add or remove categories to set up the music player just the way you like it. The album art has a central place in the Now Playing interface, but you can replace it with an equalizer. You can skip songs or FF/rewind by sideways swipes. A nice feature allows you to quickly look up a song on YouTube or via Google search. The handset also prompts you to select whether to look up the artist, the song title or the album. The video player offers a simple list-based interface. It displays all video files stored on the phone and you can sort them by name, date, type or size. The video player also remembers the last viewed position of the video, so you can resume exactly where you left off. The video player lets you choose between three crop modes for how the video fits the screen. There's 5.1 channel virtualization and subtitle support. You can change font size and adjust subtitle sync (time them back or forth) but there's no option to manually load subtitles, they have to have the same filename as the video file to load.